Busted! 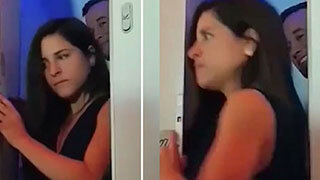 A short video posted on Facebook shows a woman and a man leaving a Virgin Atlantic aircraft toilet, one after the other – the woman looking furtive, the man with a knowing look. We know what they were doing! The video has attracted almost 9 million views. David Eve filmed the pair during a flight from LHR to MIA last week, on American Independence Day. The couple were certainly a lot more discreet about it than that pair on FR last month, who (as one news report put it) “joined the ‘mile-high club’ without using the restroom.” They just did it in their seats, while one male passenger filmed the encounter, and a female sharing the row reportedly asked to change seats. By the way, if you search ‘mile-high’ on OpenJaw.com, you’ll find 14 results in the Deviations sections of the site. We’d be embarrassed by that, except for the fact that you always read them!